Spain is famous for its festivals. Whatever time of the year you visit, there would be some or the other festival going around in Spain. The Spanish festivals resemble Spain rich culture and traditions. The good time always carve around the country may it be the dancing, food-festivals, or a patron day. Here is the guide to the festivals celebrated in Spain round the year. 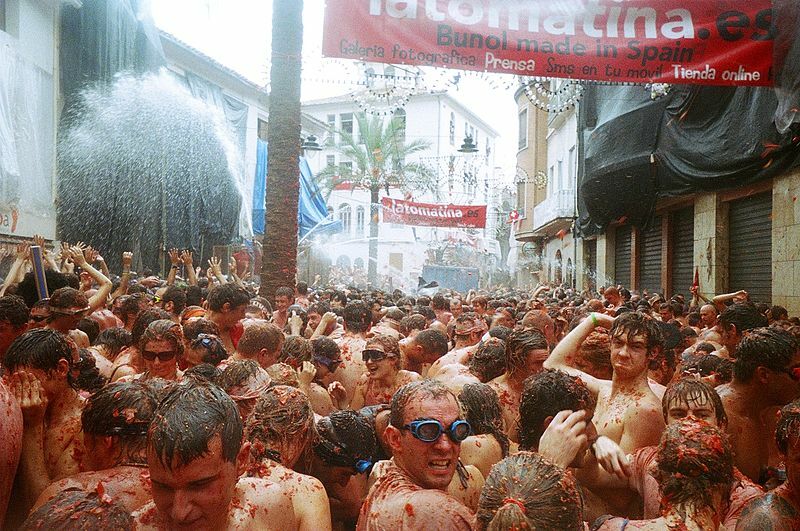 La Tomatina Festival: The very popular tomato fight is celebrated on the last Wednesday of August in Bunol town, Spain. It is recognized as the “world’s biggest food-fight” where more than 30,000 people participate and throw more than 40 metric tons of tomatoes. The festival starts at 10 AM, at this time you will see people dancing and being showered with the water from hoses. To start the tomato fight, it is required that someone should climb the greased pole and drop the ham on top. Once this happens, a signal is given when trucks loaded with tomatoes throw in the Plaza del Pueblo. The crowd then becomes crazy and starts throwing tomatoes at each other. The fight continues for an hour. The tomatoes used in this festival are of low grade and inexpensive. San Fermin: Recognized as the most dangerous festival of the Spain held in Pamplona. It is a world renowned festival and is attended by over 1,000,000 people. It is held in the honor of Saint Fermin. The festival starts from noon July 6th to midnight July 14th. The first day is marked as opening ceremony where rockets are exploded and people enjoy the fiesta start. The period from July 7th till July 14th includes the daily task of “running of the bulls”. 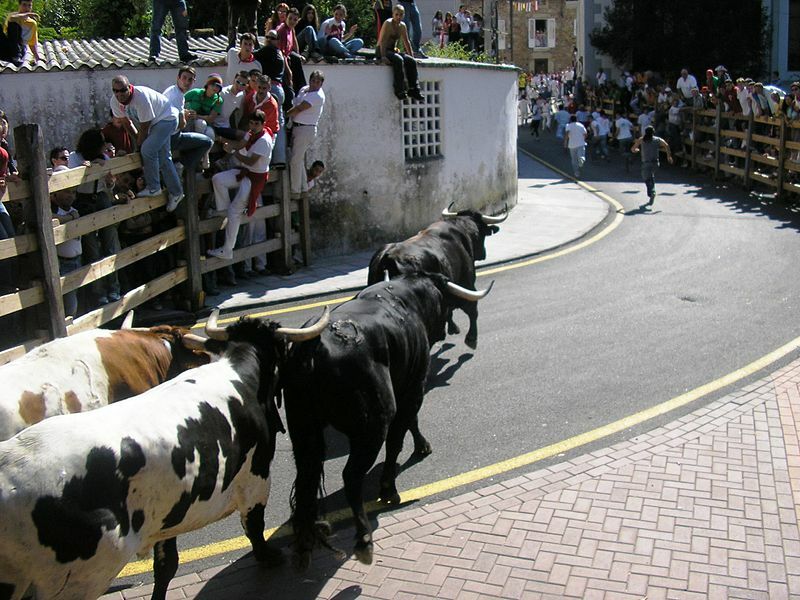 In this activity people run in front of six bulls in the narrow street of Pamplona. The event concludes on midnight July 14th with the candle light march by the people. The San Sebastian Drum Festival: The festival is celebrated on the first day of the year. It is one of the New Year celebrations held in Basque town. On this day, the drummers march around the city on deafening beats of the drums. The Child Drummer’s ceremony is celebrated the very next morning. La Endiablada: It is religious festival celebrated in Almonacid de Marquesado, Spain. It is held in the month of February. The young boys dressed up as devils wearing colorful pants, jackets, colorful hats, and tie cowbells around their waist. These boys run and dance in the street and inside the church on the music of cowbells. Fiesta de Verano: Celebrated in the month of August in Malaga, this festival starts with spectacular fireworks. The festival is celebrated in the streets of Malaga in which people wear traditional costumes and dance and eat ham, cheese, and fish with red wine. Haro wine Festival: This “Wine Battle” takes place in the summer in city of Haro. People on this day wear white shirts and carry jugs and bottles filled with red wine. 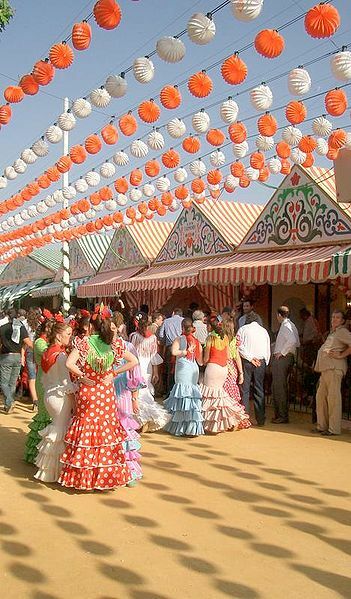 Seville Fair: This fair is held in Seville, Spain. The fair is celebrated for one week, starting from Monday and ending on Sunday. The fair is accompanied with huge stalls and tents all over the ground. All Saints Day: This celebration takes place on the November, 1st in Cadiz accompanied by lots of eating, drinking, and dancing. The people dress up traditionally. Spain has a lot to offer with so many enthusiastic festivals. Whenever you are in Spain do plan your visit to have fun in these festivals. Enjoy the rich culture of Spain Festivals. Previous PostLesson 13: ¡Me voy de viaje!Next PostLesson 14: ¿Tomamos un café? Lesson 4: ¿Qué hora es? Lesson 5: ¿Cuál es tu trabajo? Lesson 8: ¡Me duele la cabeza! Lesson 9: ¿Qué falta en la nevera? Lesson 11: ¿Qué estás haciendo? Lesson 12: ¿Haces algún deporte? Lesson 13: ¡Me voy de viaje! Lesson 14: ¿Tomamos un café? Lesson 17: ¿Pedimos una pizza? Lesson 18: ¿Qué harás mañana? Lesson 20: ¿Dónde tienes que ir?